Kalimpong, west bengal, is a quiet and peaceful town nestled at a comfortable elevation of 1,200 meters, straddling a ridge between the Deolo and Durpin hills, which ensures a pleasant climate round the year. Conquered from Sikkim by Bhutan in 1706, its name supposedly comes from ‘kaleon’ and ‘pong’ meaning ‘minister’s bastion or fort’ since it did have the presence of a Bhutanese governor for the period it remained under their rule. 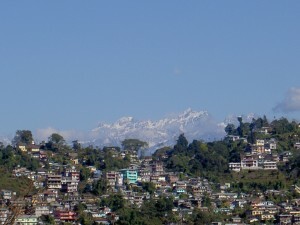 However, the Lepcha who were there long before are said to have called it ‘kalibong’ meaning ‘the ridge where we play’. In 1865, after the Anglo-Bhutan War, British India brought it under their control on becoming aware of its vantage position as an outpost for trade with Tibet, which they did accomplish in establishing. This bazaar town was originally a part of Bhutan but later it was taken over by the British and finally it became a part of West Bengal. Kalimpong is famous for its monasteries, Churches and a private library for the study of Tibetan and Himalayan languages, culture etc. Alongside the trade with Tibet, the arrival of missionaries also saw to an early expansion of Kalimpong from a sleepy hamlet to a sizable town that it is today. Schools and hospitals were established as early as 1873, and even till today the town’s reputation as an educational center is known far and wide. dr. Graham’s Homes : A unique educational institution, started in 1900 by Dr. John Anderson Graham, a Missionary, with six orphans, the school, situated in a 500 acre estate on the slopes of Kalimpong’s highest hill, Dealo, has today a strength of well over 700 boys and girls who are accommodated in small cottages in a picturesque set-up. It has its own diary, poultry and bakery and every year in the month of May the school organises “MAYFAIR”. A day’s visit there can be enthralling. Gauripur House : Now Co-operative Training Institute, Situated about 2 km from the town centre on the way to Durpin Dara, Gauripur House was one of the favorite haunts of Poet Rabindranath Tagore. He stayed there on his many visits to Kalimpong. Kalimpong Market : Your visit to Kalimpong won’t be complete unless you spend several hours or better still, several days at the two Kalimpong bazars, one on the Main Road, the other near the 10th mile. It is a unique experience to see villagers turning up in their local costume at the bazars on weekly market days to sell their farm products. Thongsa Gompa : It is the oldest and most famous Bhutanese Monastery of this place which was established in 1692. This Gompa was built under the Bhutanese rule under the direct guidance of Bhutan King. The preserved religious and cultural legacy of this summons place call on scores of tourists every year. Every day the monks offer prayers twice, once in the morning and once in the evening and the prayers are accompanied by the blowing of conch shells and long trumpets and beating of the drums. During festive occasion the masked dance ceremony is performed which is attended by large number of tourists. Tharpa Choeling Gompa : This is among the most popular attractions of this place which was built in 1937. It is the monastery of the Gelukpa sect (Yellow Hat) of Tibetan Buddhism which is belongs to the sect to which the present Dalai Lama belongs. This is situated atop Tirpai Hill in beautiful serene and scenic natural ambiances. The Gompa contains idols of the Bhaisajya, Sakyamuni and Maitreya Buddhas (past/present and future form of Buddha). The tiny hall inside the monastery decorated with images of flayed animals and humans is the foremost attractions of this monastery which gives deep insight on the life and teaching of Buddha. The Gompa is surrounded by picturesque and lush green dense forests through which one can view the scenic Himalayan ranges. Samco Ropeway : This is 120 feet high ropeway located over the famous rivers Teesta and Relli. To enjoy the thrilling experience of this adventure ride tourists flock in large number round the year. Tourists can have spectacular view of the river under the ropeway and the lush green surrounding. The view is so fascinating that it will remain unforgettable experience for any travelers. Flower Nurseries : It is the prominent attractions of this place which is visited by scores of tourists who come here from several parts of the globe. This spectacular hill town is an important flower producing center of India. Some of the other exotic flowers that cultivated here are amaryllis, lilies, anthuriums, roses, gerbera, dahlias and cacti. There are numbers of nurseries located here which is thronged by scores of tourists to enjoy the scattered scenic beauty of blooming buds. 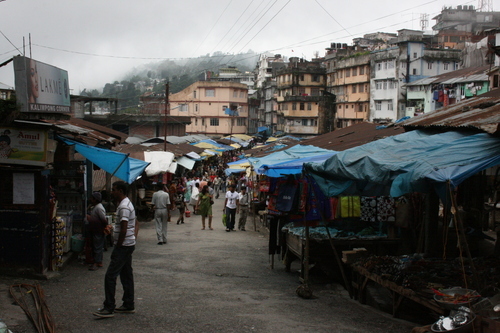 Teesta Bazaar : It is a shopper’s paradise and the main market in Kalimpong where tourists come to purchase craft, handicraft items and artifacts made by local craftsmen. With the exotic collection this market is also known for its scenic location which never fails to enthrall tourists during their visit to this place. Some of the other known attractions of Kalimpong are Lava, Neora National Park, St Theresa Church, Tashiding, Morgan House and Loleygaon (Kapher). Kalibari : Kalibari is about 2 km from town Huge statue of Goddess Kali, the main deity of this temple. Durpin Dara : It is the highest point in Kalimpong accessible by car. It offers a breath-taking view of the plains and the mighty Teesta. 7th Mile View Point : 3 km from the town on the way to Teesta Bazar. A panoramic view of Teesta Rangeet Valley can be seen from here. Mangaldham : This recently constructed place of worship is a marvellous piece of architecture. Zong Dog Palri Fo-Brtang Monastery : This is a fairly new monastery located in Durpin Dara. One can get a panoramic view of the town and surrounding from this monastery. Pedong Monastery : 26 Km from Kalimpong and was established in 1837. Hotels abound in Kalimpong which ensures best stay opportunities to the travelers. And the five-star hotels of various groups there are many luxury hotels in Kalimgpong which provide outstanding facilities endowed with grand hospitality to its guests. All hotels in Kalimgpong ensure an easy access to view the various fascinating attractions of the city. By Air : The nearest airport is Bagdogra which is 80 kms from Kalimpong. 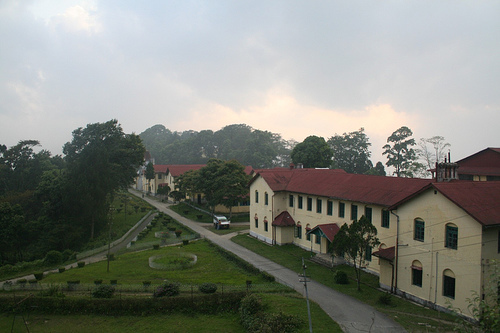 By Road : Kalimpong is connected to Darjeeling, Siliguri and Gangtok by road through buses, jeeps and private taxis.